GeoGarage blog: The final frontier: who owns the oceans and their hidden treasures? Ransom-hungry pirates, polar explorers, offshore oil giants - the race for the riches of the world’s final frontier is on. As India, China and Brazil seek new sources of cobalt, copper and nickel to build the gadgets demanded by their booming populations, they are preparing to mine a new realm - the dark depths of the ocean. Over the next decade India will spend more than $1 billion to develop and test deep-sea technologies - including human-piloted exploration submarines - in the Indian Ocean that could give access to once inaccessible mineral riches up to 6.8 miles (11 km) under water. But mining the seas - home to the vast majority of life on Earth - carries huge risks and could cause irreversible damage to the environment, campaigners warn. Oceans - which scientists say are less understood than the moon or Mars - cover more than 70 percent of the Earth’s surface, yet less than 20 percent of their seafloor has been mapped or observed, according to the U.S. National Oceanic and Atmospheric Administration (NOAA). The so-called “blue economy” of marine resources is expected to contribute $3 trillion to the world’s GDP by 2030 - equivalent to the size of the UK economy - up from $1.5 trillion in 2010, according to the Organisation for Economic Co-operation and Development (OECD). 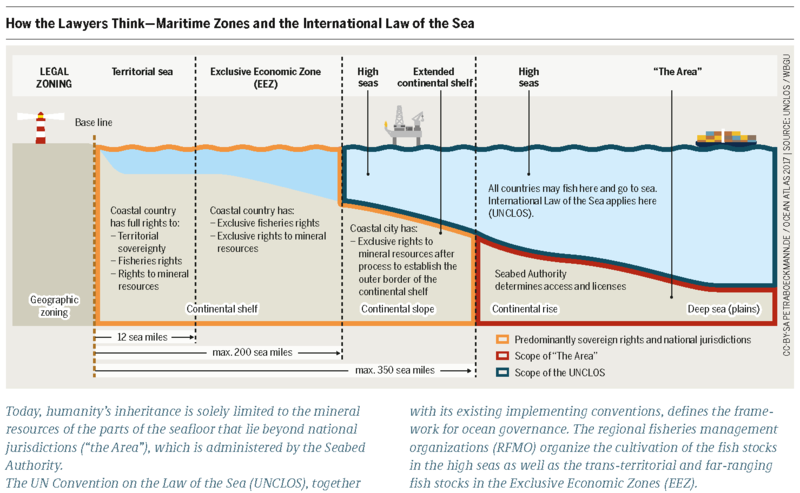 Experts say oceans are a neglected area of global governance despite the United Nations’ 1982 Convention on the Law of the Sea (UNCLOS) and the 193 member states agreeing in 2015 to a global goal to sustainably manage and protect marine resources. Smart rules are essential to keep oceans healthy - but because nobody owns them, “we have a real problem”, he said. Liz Karan, senior manager for the high seas at Pew Charitable Trusts, a non-profit organization, said existing regulations were patchy and had struggled to protect ecosystems in international waters. But a proposed U.N. treaty to protect ocean biodiversity - and prevent over-exploitation - could change that. Negotiations on a legally binding treaty – which would cover the high seas, or ocean areas that extend beyond national boundaries capped at 200 nautical miles from coasts – began in September and aim to reach an agreement by 2020. But government and U.N. action are only part of the answer, experts caution. “Governments are good at setting targets, but to really get things done you’re going to need more than hoping U.N. agencies alone can fix this,” said Waughray. He said technology and monitoring tools to enforce the would-be treaty would be crucial. So who are the main players controlling Earth’s final frontier? And how will the global hunt for resources affect the communities who now depend on the seas to survive? How can Senegal combat illegal fishing? The legal fight over the sea is also playing out at national levels. The Latin American nations of Colombia and Nicaragua, for instance, have for decades fought over a cluster of islands in the western Caribbean - and the fishing rights around them. In 2012, a ruling by the International Court of Justice redrew the maritime borders around the archipelago of San Andres, Providencia and Santa Catalina in favor of Nicaragua, reducing the expanse of sea belonging to Colombia. The loss of waters – and of income – has hit the islands’ artisanal fishermen hard, with some saying the money they make from fishing cannot even pay for the fuel to power their boats. “Our territory at the end of the day is the ocean,” said Erlid Arroyo, secretary of agriculture and fishing at the governor’s office in San Andres. He estimated lost income from the court ruling at “millions and millions of dollars”. But the crisis has spurred a rethink of the island’s fishing industry, he said, with the government training fishermen to catch fish in other areas and make more of their catch. These islands’ underwater riches might not last, however. In the last few decades, the oceans have undergone unprecedented warming while currents have shifted. From the waters off the east coast of the United States to the coasts of West Africa, the changes are causing fish and other sea life to seek out new waters - leaving the communities that depend on them facing disruption as a result. For other communities, fishing regulations present the most potent threat. For decades the Inupiaq, a Native Alaskan group living north of the Arctic Circle, have argued that international limits on subsistence whaling were not big enough to meet their food needs. “They controlled what we could hunt and what we could eat,” said Roy Nageak, a retired whaling captain, referring to when the International Whaling Commission (IWC) set quotas on catching bowhead whales in 1977 to protect existing stocks. The Inupiaq hired scientists to convince the IWC that whale stocks were still healthy and to increase the quota, said Crawford Patkotak, an Inupiaq whaling captain. Inupiaq leaders welcomed the International Whaling Commission’s decision in September to reaffirm their shared quota of 56 whales per year, increase the number of unused strikes permitted to carry over into the next year, and to renew aboriginal quotas automatically. “We’ll now be able to hunt in peace without the anxiety of worrying about an expiring quota,” said Patkotak. When Oscar-winning director James Cameron ventured in 2012 on a record-breaking solo dive to the deepest-known place on Earth in the Pacific Ocean, he described a flat, desolate landscape, 50 times larger than the Grand Canyon. Resource-hungry countries are racing ahead in the hunt for minerals, with India planning to explore a 75,000-square-km (29,000-square miles) area of the Indian Ocean - equal to about 2 percent of the country’s size. China, the world’s second-largest economy, is seeking minerals in the eastern Pacific Ocean. And Brazil has won rights to explore the Rio Grande Rise off its southeastern coast, in the southern Atlantic Ocean. But, with little of the deep ocean mapped or explored, environmentalists worry about the potential loss of species not yet well understood - or even recorded. The hunt for yet another ocean resource - offshore oil - could have disastrous consequences for marine wildlife, campaigners warn. Last December, Italian oil producer Eni began drilling a new well in U.S. waters off the north coast of Alaska – the first company to drill in the area since 2015, and a move warily eyed by indigenous communities. Arnold Brower Jr., executive director of the Alaska Eskimo Whaling Commission (AEWC), worries that potentially devastating oil spills could affect whale food sources, including krill. “Of course we’re concerned because we’ve seen the mess down in the Gulf of Mexico - BP’s blowout,” he said, referring to the Deepwater Horizon oil drilling rig that exploded in 2010, causing the worst spill in history. The Coast Guard and other Law Enforcement Agencies of Bangladesh deserve respect and reverence to bring such trafficking incidents into concern. To intercept and detect such incident is not an easy task. 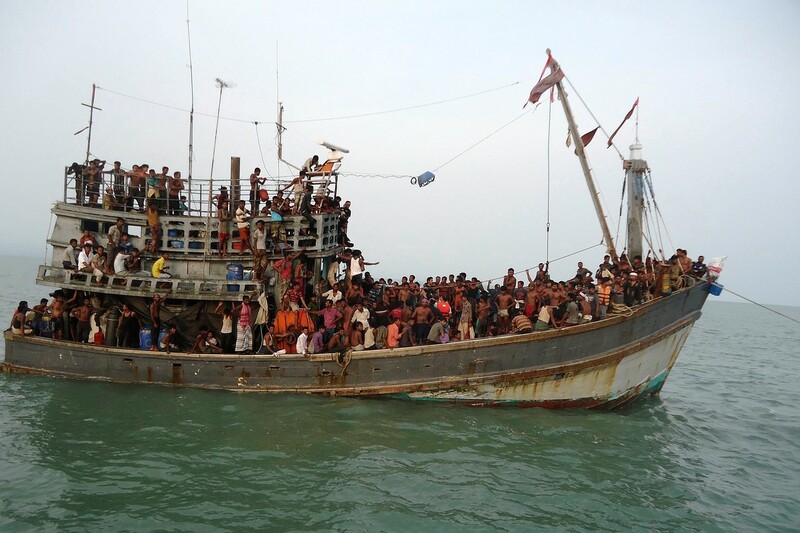 Small human trafficking vessels enter into the territorial water of Bangladesh at night. These vessels then take people and cross the territorial water boundary at night. o, it is very difficult to detect such vessels at sea. The multi-billion-dollar seafood industry has come under scrutiny – particularly in Thailand – after investigations showed widespread slavery, human trafficking and violence on fishing boats and in onshore processing facilities. Part of the problem stems from a lack of oversight on fishermen’s working conditions on the high seas, said Brandt Wagner, head of the transport and maritime unit at the International Labour Organization, a U.N. agency. The main international convention regulating crew safety and conditions on fishing vessels - called the Cape Town Agreement - was adopted in 2012 by the International Maritime Organization (IMO), a U.N. agency. The detention was the first under the International Labour Organization’s Fishing Convention , which seeks to improve fishermen’s working conditions. “I believe there’s worse things happening,” he said. Authorities are trying to police another kind of criminal wreaking havoc on the seas - pirates. While piracy has decreased worldwide in the past decade, the Gulf of Guinea off the coast of West Africa has become an increasing target for pirates who steal cargo and demand ransoms, according to the International Maritime Bureau (IMB). We’ve mapped other planets to more detail than we have our own oceans. How close are we to a complete ocean map? A U.N.-backed initiative, called Seabed 2030, is trying to do that by pooling data from around the world to produce a publicly available map of the entire ocean seafloor by 2030. “Can you imagine operating on the land without a map, or doing anything without a map?” asked Larry Mayer, director of the U.S.-based Center for Coastal and Ocean Mapping, a research body that develops tools for underwater mapping. “We depend on having that knowledge of what’s around us - and the same is true for the ocean,” he said. The project initiated by the Nippon Foundation, a Japanese philanthropic organization, and GEBCO, a non-profit association of ocean experts, aims to improve knowledge of marine biodiversity, predict disasters and protect deep-sea resources. “(It) goes back to this principle: the ocean is an international space by definition ... part of the common heritage of mankind,” said Barbiere. Wired : Deep sea mining could save humanity from climate change disaster. But at what cost?